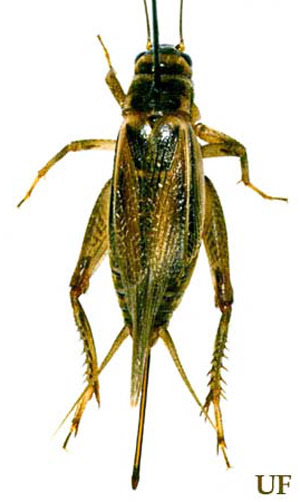 The house cricket, Acheta domesticus, is commonly encountered in Florida in only two contexts: bait for fish and food for pets. This is because it does not survive very well in the wild in this part of the United States. House crickets that are sold in bait and pet stores are reared in large commercial cricket factories or by local entrepreneurs. The house cricket is probably native to southwestern Asia, but has been widely distributed by man. In the United States it occurs wherever it is sold, but it survives in feral populations only in the eastern United States (except peninsular Florida), and southern California. Why it fails to survive in peninsular Florida is not known. Figure 1. U.S. distribution of the house cricket, Acheta domesticus (Linnaeus). 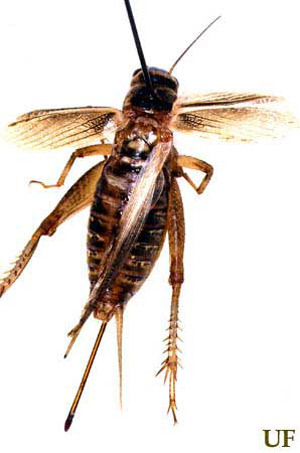 House crickets take two to three months to complete their life cycle when reared at 80 to 90°F. They have no special overwintering stage, but survive cold weather in the northern States and Canada in and around buildings and in dumps, where heat from fermentation may sustain them. Eggs are deposited in whatever damp substrate is provided - for example, sand or peat moss. Juveniles resemble the adults except for being smaller and wingless. The house cricket is a 16 to 21 mm long, light yellowish-brown cricket, with wings that cover the abdomen. It has three dark transverse bands on the top of the head and between the eyes. All house crickets have long hind wings when they become adult, but they sometimes shed them later. Figure 2. An adult female house cricket, Acheta domesticus(Linnaeus), with hindwings intact. Photograph by Paul M. Choate, University of Florida. Figure 3. An adult female house cricket, Acheta domesticus (Linnaeus). Forewings extended, revealing intact right hindwing. Left hindwing has been shed. Photograph by Paul M. Choate, University of Florida. In Florida, house crickets are usually found where they have recently escaped or been released - for example, on the shores where people fish. As in most other crickets, male house crickets make a calling song by rubbing a scraper on the inner edge of the left wing against the teeth of a file that is beneath the right wing. The calling song (689 Kb wav. file) is a series of short chirps. Each chirp consists of two or three pulses which correspond to two or three wing closures (graphs). Wing openings are silent. House crickets, as well as various native ground-dwelling crickets, are easy to rear in small numbers in the home or schoolroom. Among Web-published rearing instructions is Breeding and Raising the House Cricket (for feeding captive herps). Generally house crickets do no harm. However, if crickets kept for pet food or fish bait escape into your home and annoy you with their calls, you can eliminate them by setting out baits that are sold for cockroach or earwig control. Hallett I. (December 2009). Breeding and raising the house cricket. Herp and Green Iguana Information Collection. http://www.anapsid.org/crickets.html (29 July 2011). Fasulo TR, Kern W, Koehler PG, Short DE. (2005). Pests In and Around the Home. Version 2.0. University of Florida/IFAS. CD-ROM. SW 126. Weissman DB, Rentz DCF. 1977. Feral house crickets Acheta domesticus (L.) (Orthoptera: Gryllidae) in southern California. Entomological News 88: 246-248. Walker TJ. (2014). House cricket, Acheta domesticus (Linnaeus 1758). Singing Insects of North America. (11 April 2014). Wineriter SA, Walker TJ. 1988. Group and individual rearing of field crickets (Orthoptera: Gryllidae). Entomological News 99: 53-62.